On Tho's birthday we meditate in the shrine room in front of the cave where Guru Rimpoche had meditate at Tigersnest. A mural painting depicts him "flying" on the back of a pregnant female tiger, that actually was his consort Yeshe Tsogyal, to Tigersnest. From this came the name "tigers nest". Coming back to Bhutan after 6 weeks in Vietnam has this nice feeling of “coming home”. Firstly coming home to Tho, to “our” flat, to “our “friends, but also the country feels so familiar and cosy to come home to. We both are “mountain people”, me as an Austrian of course, but also Tho has a deep destiny with mountains: the Himalayas where it “all started” in 1969, the Alps where we took our significant sabbatical where we organize yearly retreats in Chandolin, the Pyrenees…and now the Himalayas again.. I asked Tho this morning about Guru Rimpoche, Padmasambawa The Patron Saint of Bhutan. Ever since I am in Bhutan I meet him everywhere… In every temple, in every monastery, everybody carries his pictures, stories and many many stones, trees, rivers mountains carry his memory and miraculous deeds. Guru Rimpoche arrived, like floating down towards me, He took my hand and we together “entered“ this map…the map rolled out more and more and became big as the country, and we, Guru Rimpoche holding my hand, floated from south to north, east to west of Bhutan. He was pointing out some high peaks, some rivers, some rocks, some wild animals (a tiger!) some monasteries to me, I remember this nice feeling of “flying” over the country and being guided so safely! 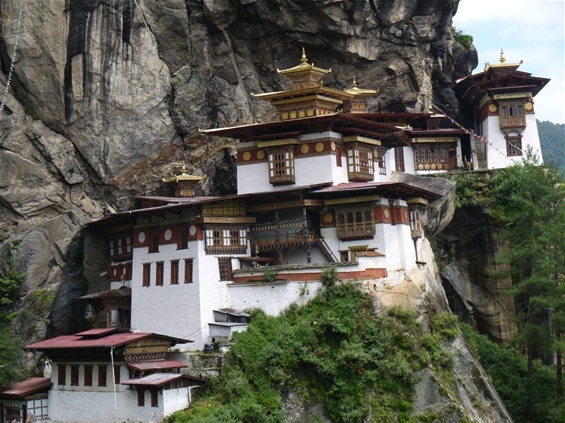 Padmasambhawa brought Buddhism to Bhutan. He was born in what is now Pakistan, the Swat Valley in the 8th century. When he arrived in Bhutan, Bhutan was a country with many warlords. Maybe one could say a “primeval” society? The religions were animistic. There are many stories of demons, of nature beings ruling over regions, and the country. 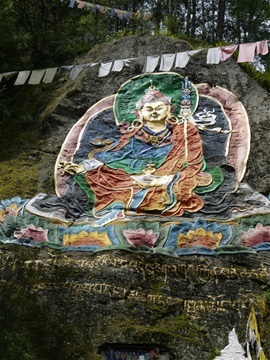 Guru Rimpoche brought Buddhism in such a way that he included the local culture perfectly into the Buddhist teachings. He pacified local “demons” transformed them into protectors of Buddhist Dharma, included ancient wisdoms and tradition and guided the whole country towards a compassionate and wise society. He performed many many miracles that are still alive in the local consciousness. So actually I had the perfect guide when I arrived in Bhutan! 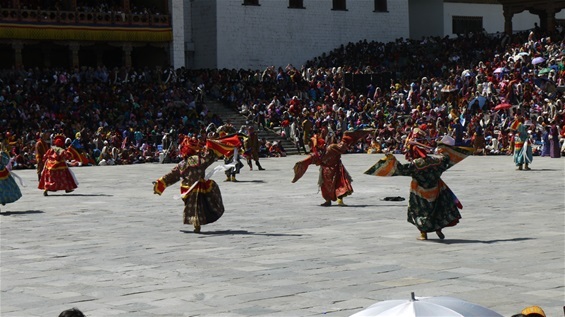 But just imagine, he came to Bhutan in the 8th century…and until today his presence is felt by everyone living here and even me, coming from far, I felt welcomed by his Presence.